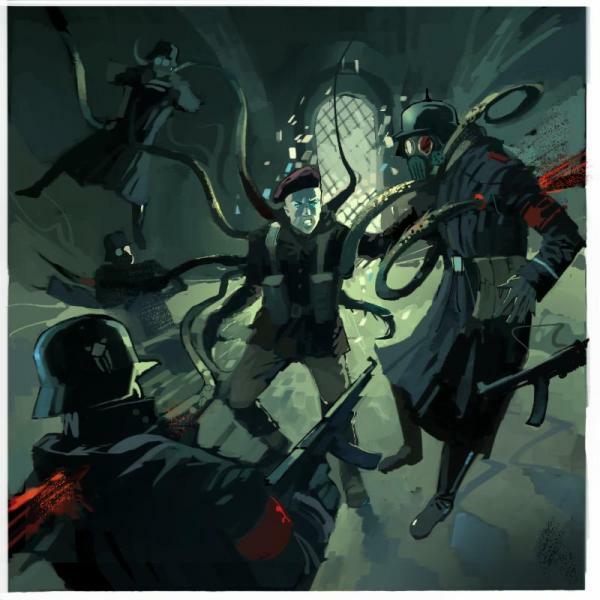 Today we’re really pleased to announce a revised version of Tales from the Crucible, our FREE dossier of Achtung! Cthulhu heroes which is now available for both 6th and 7th edition Call of Cthulhu. Tale from the Crucible is now available as a FREE download from Modiphius.net or DriveThruRPG.com. The iconic heroes of Achtung! Cthulhu detailed herein: Professor Richard Deadman, Captain Eric “Badger” Harris, Ariane Dubois, Natalya Petrova and Corporal Akhee “The Eye” Singh, have been revised and updated with fuller, more detailed back stories plus new art from Dim Martin and this edition also features two brand new heroes, “Mad” Jack McMasters and Corporal Liebowitz, to help you tip the balance in the fight against the might of the Nazi war machine. All have been fully statted up for both sixth and seventh edition Call of Cthulhu with a full range of skills, weapons and equipment and these powerful individuals are ready to use as part of existing campaigns, or to kick off brand new ones. Whether as one-off guest stars, or ongoing heroes who’ll become an integral part of your Secret War experience, these brave, resourceful and in some cases, downright dangerous individuals, are the true heroes of the Secret War.